With the recent discussion over walking and cycling on Green Dragon bridge I thought I would take a look at the actual number of cycles on the bridge. There is an automated cycle counter at the bottom of the bridge although there are no automatic counters for pedestrians. 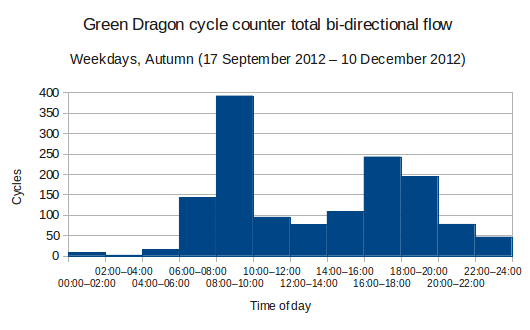 The headline figures are that there are in excess of 1000 cycles a day are counted at the bridge in both directions and the peak flow is typically around 250 cycles per hour. That is a lot of people that could be inconvenienced by any changes to the bridge, and a lot to be accommodated in a path of only 2.3m width. We also see that Cambridge people cycle year round, not just in the Summer. Please read the notes below about the counters and what is actually counted. 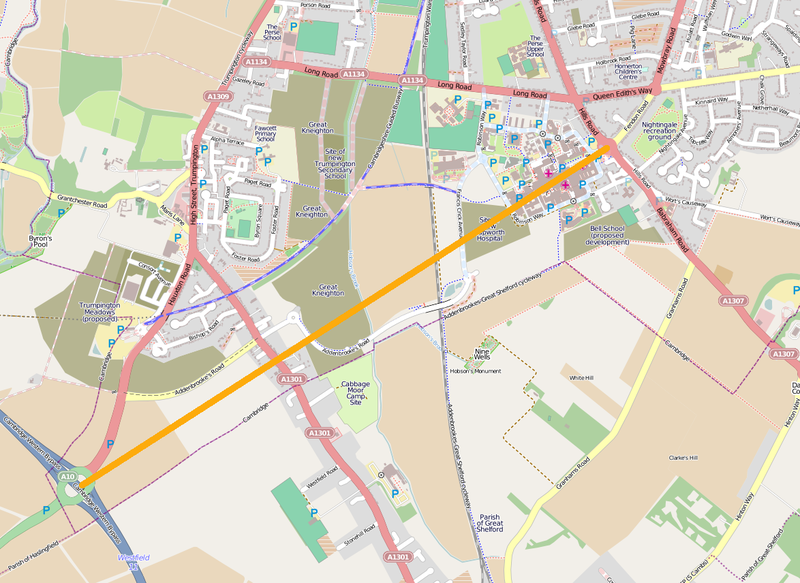 I would like to thank Cambridgeshire County Council’s Cycling Projects Team for providing the data. Here I plot the figures per season to see what seasonal variation there is. Inbound means towards the city centre, outbound means towards Water Street. If you thought that people only cycle in the summer, the following chart shows the daily total number of cycles per weekday (based on a 5-day average). There is a noticeably lower level during the summer, no surprise in a city with two universities and other colleges and schools. You can also see a pronounced dip over the Christmas and New Year period. 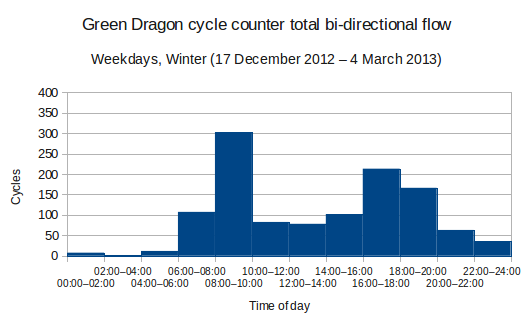 It’s clear that people in Cambridge cycle all year, and over this year we had very mixed weather! 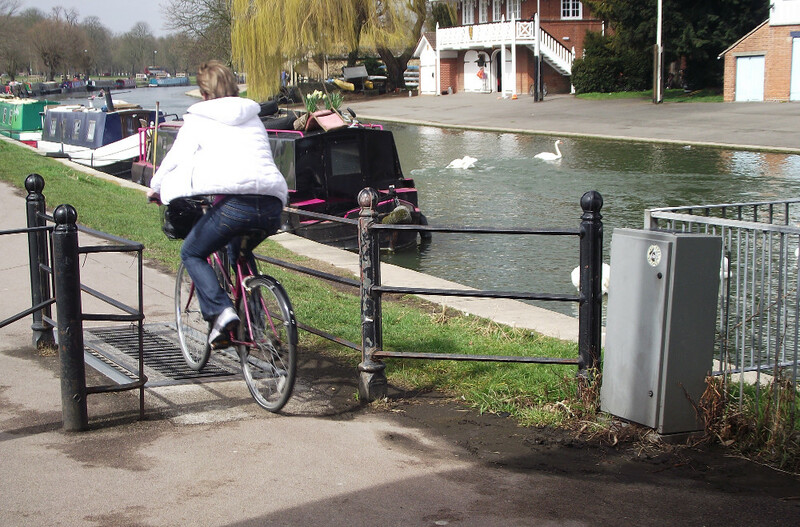 The grey box on the right is the solar-powered cycle counter at Cutter Ferry bridge that sends its data over the GSM network. There are a number of cycle counters on key routes around the city that count the number of bicycles passing them every fifteen minutes. 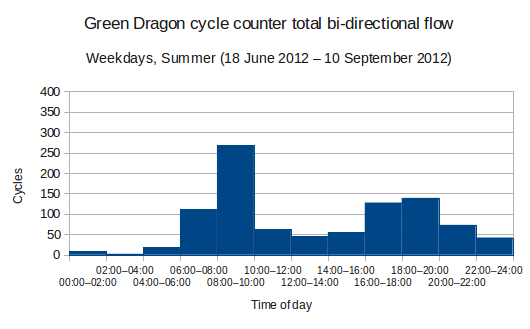 The Cycling Projects Team at Cambridgeshire County Council kindly provided the data for the counters at Green Dragon bridge. There are two counters here, one on the route to Fen Ditton and one near the start of the ramp to Green Dragon bridge. Due to the location of the counters and their sensors neither record the number of cycles actually crossing the bridge. Some cyclists continuing along the river and not crossing the bridge get counted on both counters while those going to/from Fen Ditton and crossing the bridge also get counted on both. Rather than trying to combine the figures from the two counters to come up with an uncertain estimate of cycles actually crossing the bridge I decided to use just the figures from the single counter. 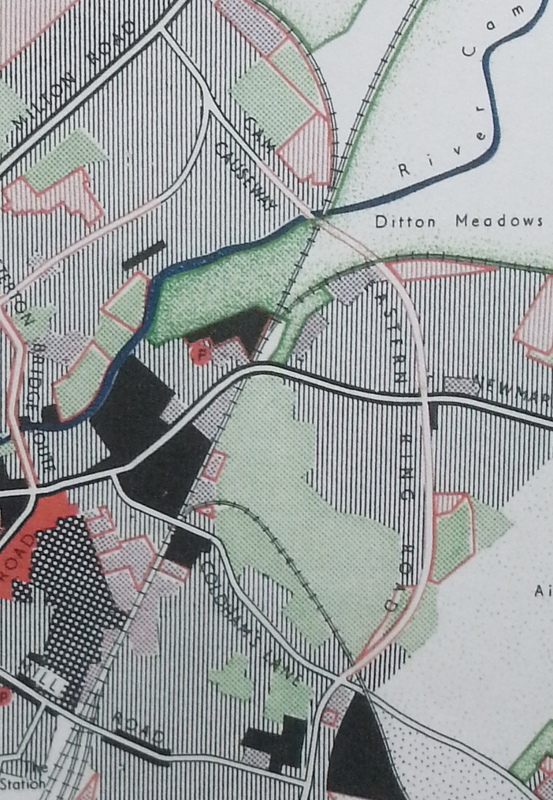 The typical numbers on the path to Fen Ditton are about 10% of the number at the other counter. The cycle counter has two channels and on the advice of the Cycling Projects Team I have had to infer the direction of travel from the data. I have just under a year’s worth of data that I have grouped in to four quarters, the start and end dates of which are somewhat arbitrary. I hoped to get some insight in to these questions: Are there any seasonal variations? Do people in Cambridge only cycle in good weather? A local politician recently decided to stir up the hornets nest that is cycling on the Green Dragon bridge. This bridge is the last crossing of the River Cam in the north east of the city and a vital link for pedestrians and cyclists traveling across the city (the bridge is unsuitable for motor traffic). 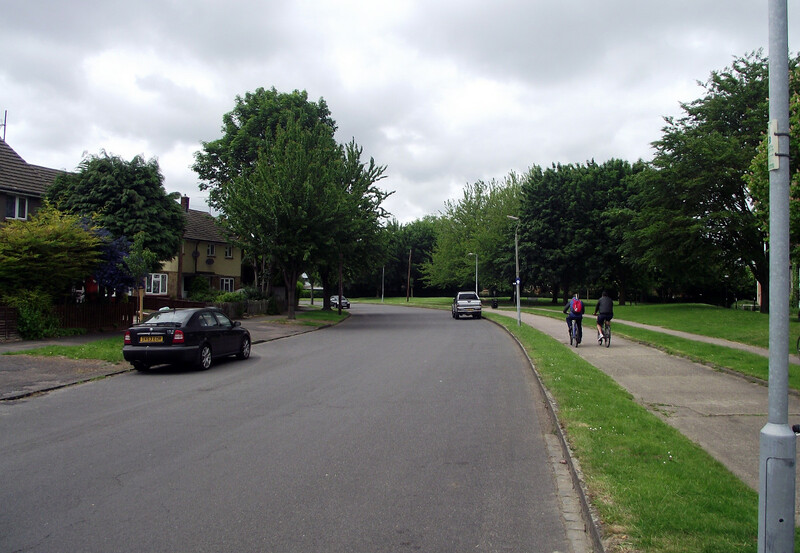 Some people believe it is simply too narrow for cycling on, others believe that it ‘works’ because most cyclists are considerate and with no prospect of widening or replacement we should just get on with it. 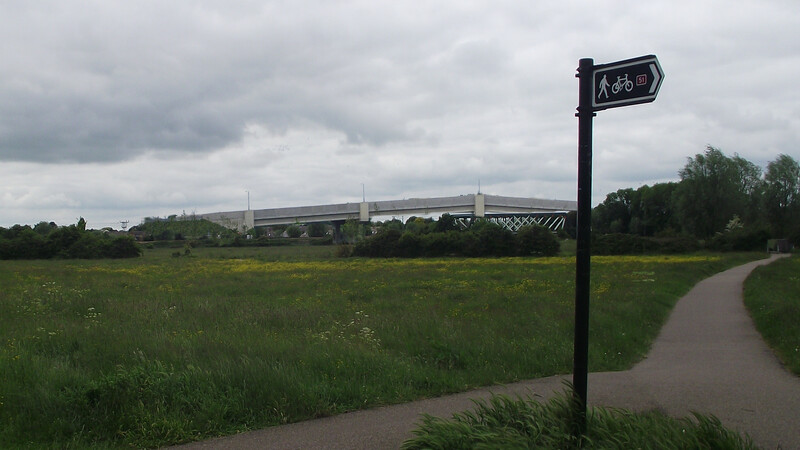 Tempers are probably frayed because some believe that cycling on this bridge is illegal. 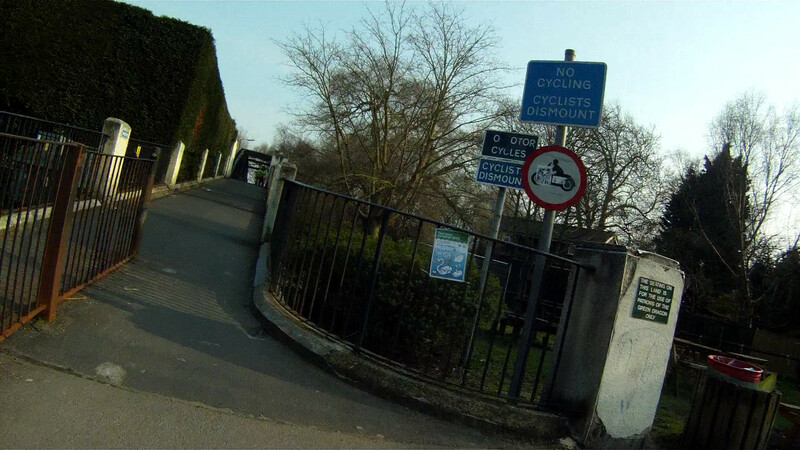 At the end of the bridge is a tatty array of signs ‘NO CYCLING’ ‘CYCLISTS DISMOUNT’ which being on a blue background are advisory. The bridge has a width of 2.3m (ramps are wider) and has a peak flow of around 250 bicycles an hour in the morning peak (more on this in a later post). The combination of poor signage and a narrow path is causing avoidable problems here, as in many other places. Pedestrians don’t like shared use, cyclists don’t like shared use and motorists don’t like shared use, so why do we continue to build it? The Dutch don’t do shared use paths. 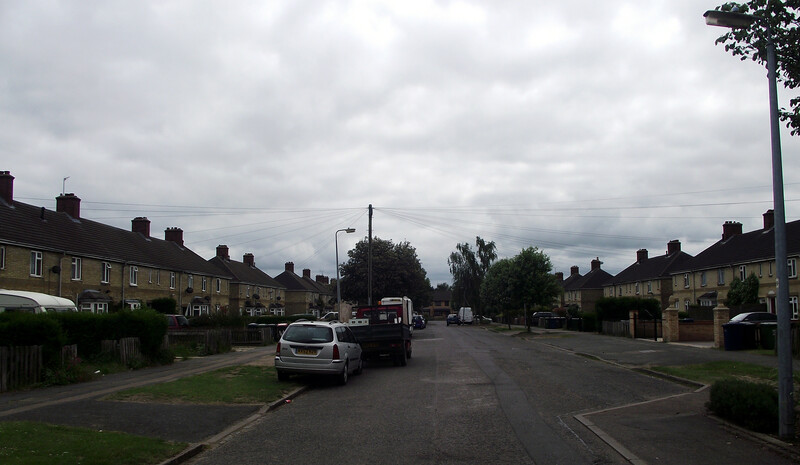 They have a cycle track width of (generally) 2.5m for one way and 4m for two way[Hembrow]. I’ve not looked up guidance for UK infrastructure, let’s learn from the best of the Dutch experience. What was a two lane road has been narrowed to about one and a half lanes and a sub-standard shared use path squeezed in. Note also the sharp angles on the path so there is space for ghost islands on the road! All we need is some ‘Cyclists Dismount’ signs and a forest of bollards on the path to keep out cargo bikes and pushchairs and this could be a showcase of dismal UK design. There will be complaints if this is built as shown. Fortunately Ely Cycling Campaign are on the case, who have a ‘Go Dutch‘ strategy for infrastructure. There are no details yet but they are seeking to use the approximate 3.5m width of the removed road lane for pedestrians and cycles. I look forward to seeing the amended designs!